Samsung is rolling out its new branding in full, announcing a new naming scheme that will now see all of its Windows PCs under the Ativ name - and among them are the new Ativ Book 5 Ultrabook and the Ativ Book 6 laptop. The Ativ name has been used just for convertible devices until now, but all of Samsung's Windows computers will now adopt the new moniker. 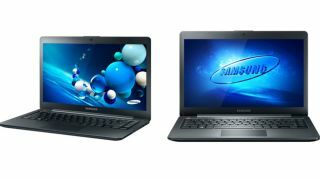 This includes previous products, which have been renamed retrospectively: the Series 7 All-In-One is now the Ativ One 7, the Series 9 is now the Ativ Book 9, and so on. Confusing? Maybe a little. The new Ativ Book 5 features a 14-inch 1366 x 768 touchscreen, runs on a 1.8-GHz Intel Core i5-3337U processor with integrated Intel HD 40000 graphics, and packs 4GB of RAM and 500GB of storage. This one's available starting from $900 (around £580 / AUS$875). The Book 6 comes with a slightly more substantial 15.6-inch 1080p touchscreen, hosts a Intel Core i7 CPU, a Radeon HD 8770M graphics chipset, 8GB of RAM and a 1TB hard drive - it can be pre-ordered for $1,200 (around £780 / AUS$1170). Both can be pre-ordered from the US site today. Meanwhile we've contacted Samsung to ask when these will be available in the UK and Australia, and will update when we know more.